Heaney offered his reader a clue as to how to ‘enter’ the poems: You could think of every poem in ‘Squarings’ as the peg at the end of a tent-rope reaching up into the airy structure, but still with purchase on something earth­ier and more obscure (DOD 320). So long for air to brighten, said Fosterling. Time to be dazzled and the heart to lighten. Heaney’s observer sits astride a crag top at a quarry’s edge, close to a sheer drop (Overhang of grass) where Nature clings precariously but persistently to life (seedling birch). 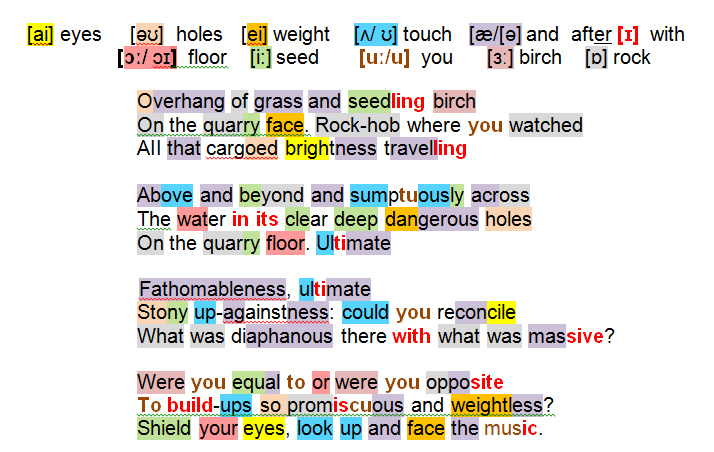 Heaney identifies himself as the lofty speaker (Rock-hob where you watched), a man in his fifties studying the cargoed brightness carried along by the laws of meteorology: ineffable (travelling/ Above and beyond) awesome in its fullness (sumptuous); visible even from ground level (water in its clear deep dangerous holes/ On the quarry floor). He identifies a timeless interplay of two extremes: the ultimate fathomableness of what can be seen and passed through; the ultimate stony up-againstness of the earth-bound and impassible. Have you, he asks himself at this moment of self-reckoning, grasped the difference between what offers infinite scope (diaphanous) and what is unyielding (massive); how did you respond (equal to or … opposite) as regards things and notions as they took shape (build-ups), disorderly (promiscuous) or volatile (weightless). He counsels himself threefold: don’t let the brightness blind you (Shield your eyes); go for the ‘scope’ option (look up), live with an unignorable reality you cannot change: face the music. Lightenings i and x juxtapose huge skies offering ‘shifting brilliancies’ and diaphanous scope with earth-bound situations from which to survey soul and intellect, present and future; life and death; in both cases water pools reflect the earthly order back into the airy, from surfaces with a geometry similar to the marble track of Lightenings iii. HV (144) … by the time of Seeing Things mud has hardened from its nimbus-gaiety into a quarried cliff-face looming over water – Heaney’s new hieroglyph of the world governed by the intractable laws of physical necessity. The question now is not how to reconcile the sullied flesh with the lucent soul, but how – in ‘Squarings’ x – to reconcile the water of the diaphanous virtual with the rock of the massive material. The imagination must work to set mobility of mind against the immobility of the inhuman.